Mike Jones is an artist who takes inspiration from the post war Welsh culture of the mining valley community in which he grew up. His work reflects his distinct and expressive appraisal of the simplicity and strength of powerful images rooted in the social and working life of the people and the hard living conditions of the valley, past and present. Over the last two decades Mike has gained a reputation for his evocative portrayals of the Welsh landscape and its people and has exhibited widely across Wales. He has held numerous one -man shows and exhibits regularly at The Albany Gallery, Cardiff and The Attic Gallery, Swansea. 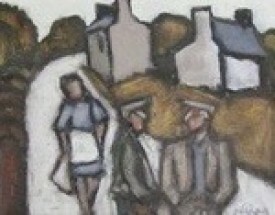 He has contributed to several television presentations on the visual arts in Wales and his work is held in many private collections and in The National Library of Wales. “In drawing and painting, I endeavour to give emotions, ideas and memories a permanent form. 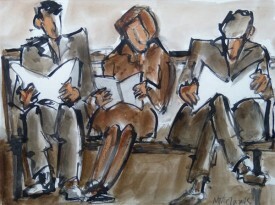 I find inspiration in simple subject matter, women scrubbing steps, figures sitting in waiting rooms, men and women, places and times of my childhood and imagination. Through my art I try to convey emotion and attitude which I hope will connect with the viewer. The essence of my work is the spontaneous and intuitive response to my subject matter.” (Mike Jones) “The figures in black and white stay in my mind. I am also impressed with the textures of his oil pastels, he is extremely gifted.” (Josef Herman R.A. 1998) “I have been familiar with Mike Jones`s work for some years, finding it always good, always imaginative. Talented and sensitive.” (Will Roberts 1997).